Tommy Ermolli, the young guitarist (only 21) for Khymera and Twinspirits, brings his first solo project Step Ahead proving himself to a musician with maturity beyond his age. 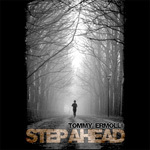 Started in 2004, Ermolli began writing Step Ahead as solace from the tragic death of a family member; the piece Magic is named for him and the album is dedicated to him. He recorded the lion's share of the work in his home, and is helped by fellow Twinspirits cohorts Daniele Liverani (k), Dario Ciccioni (d,p) and Alberto Rigoni (b). The essence of Ermolli's musical effort is pure melodic guitar rock with hints to heavy metal, but don't expect massive amounts of neo-classical shredding here. No, Ermolli's style is more nuanced and suggestive a greater range of fret work. Certainly, he executes as a guitar hero on songs like Endless Space and Taking, but he's shred and innovative on Enlightening Darkness and Magic like the progressive side he supplies to Twinspirits. Frankly, it's quite enjoyable to impressed by creativity and composition that goes beyond mere lightning arpeggios. Quite recommended! On his first solo effort Step Ahead, Tommy Ermolli (Khymera, Twinspirits) proves he has guitar skills and musical maturity beyond his youth.